I love smoked fish, in fact, I go trough periods when I will have it pretty much every day – for months. I will eat it with spring greens and fresh lemon juice, or I will top crackers with a piece of fish and cilantro dressing and have it as a late night wine snack. Last night though, I was craving warm comfy soup and I wanted somehow to incorporate smoked fish into it. I was looking for something elegant and silky rather than the chunky fisherman type of soup. I went on the internet for some inspiration and I came across this recipe. I never thought of using an entire head of celery since celery has a very distinct taste, but I gave it a shot. I modified the recipe a bit to match my taste by adding a carrot and an onion, for a full-rounded body, and replaced the trout with white fish, which has a softer meaty texture. The result was a silky and elegant yet homy soup. It became an instant favorite of mine. Combine the first 7 ingredients into a large pot. Bring to a boil; reduce heat to low and simmer for about 30 min, or until the celery root is soft when tested with a fork. Using a hand blender: Place blender into the pot, set to low speed and gently puree until smooth. Taste the soup, if the texture is grainy, continue to puree. Add butter and puree until incorporated into the soup. Add pepper and salt to taste. 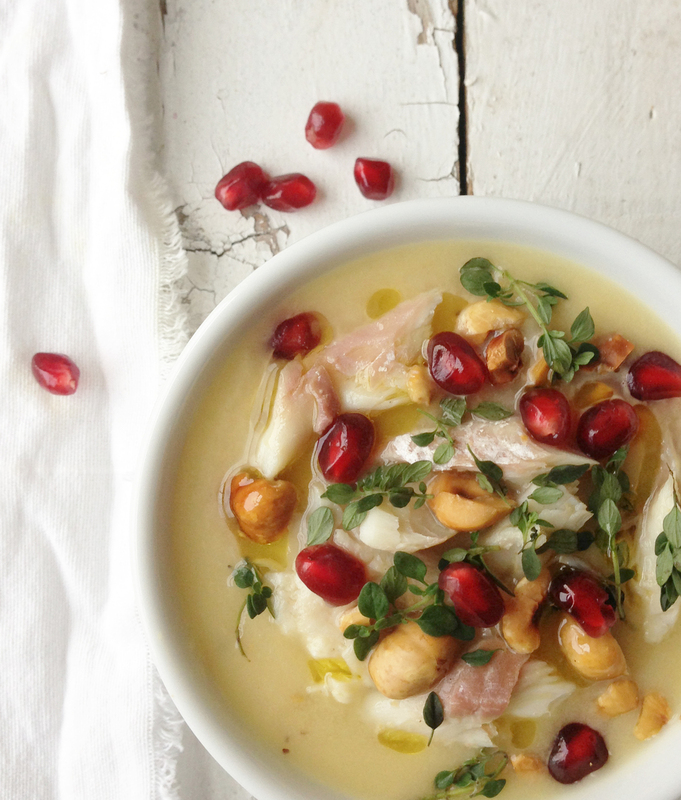 Pour the soup into bowls and top with smoked fish and hazelnuts. Add pomegranate seeds and lemon thyme if desired.